A day in Palembang | Walk with us! 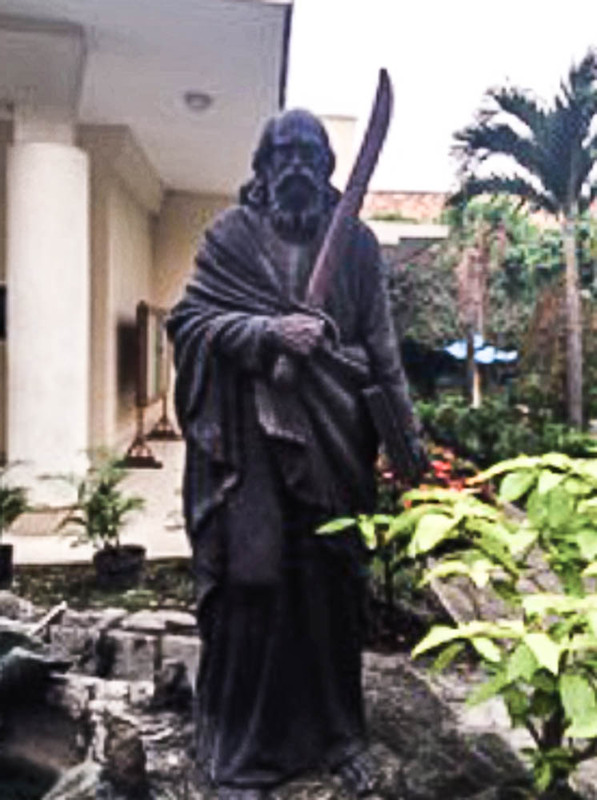 This statue of St. Paul with sword in hand stands outside the chapel of St. Paulus Minor Seminary where some of the residents in the area come for Mass. Tomorrow morning I will find out just how many attend as we’ll celebrate Sunday Mass at 6:30 a.m. As for today, I spent the morning touring a number of the churches in Palembang with Fr. Ignatius, a diocesan priest I know well as he spent several years living at Sacred Heart Seminary and School of Theology, first improving his English, and then attending Cardinal Stritch University earning a master’s degree in Educational Administration. He was our driver and was accompanied by Fr. Tri Mardani, SCJ. 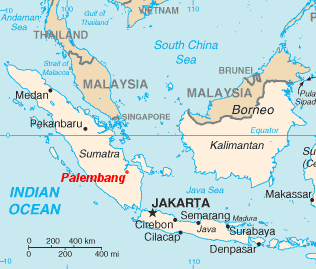 Palembang was raised to the level of an archdiocese on July 1, 2003. The latest statistics I could quickly find on the internet were also from that year and listed it as having a Catholic population of 76,201 out of a total of 10,828,441 or .7%. The archdiocese covers three provinces of South Sumatra, Jambi and Bengkulu. It’s interesting that the Diocese of Tanjungkarang (Lampung) actually contains more Catholics, but since Palembang is one of the largest cities in Indonesia ranking 9th with a city population listed at 1,030,732 it became the archdiocese. In Sumatra only Medan (also an archdiocese) with a population of 2,185,789 outranks it coming in as the 5th largest city in all of Indonesia. I was looking forward to meeting with Archbishop Aloysius Sudarso, SCJ, as I have known him since he was a student priest at Loyola University in Chicago and living with our SCJ formation community. Unfortunately at present he is in Jakarta attending the meeting of the Indonesian Bishops Conference. I found it interesting that both the US Bishops and their counterparts here meet at about the same time. I leave here on Tuesday for Lampung and the archbishop will not return until the 15th so our paths will not cross. For many years Indonesia was truly mission territory and as such religious communities were tasked with building the local church. In the last 15 to 20 years a transformation has taken place where enough local (diocesan) clergy are now in place to take over many of the parishes previously staffed by religious. That is true in both Palembang and Tanjungkarang where the SCJs have served since coming to Indonesia in 1923. Of the four parishes we visited this morning two were staffed by diocesan clergy and two by SCJs. Here at the seminary most of the religious on staff are SCJs but it also includes Fr. Ignatius, a member of the local diocesan clergy. Slowly the SCJs are taking over other ministries, particularly in education. This is at all levels, i.e., primary, secondary and at Musi University2 where they staff a number of positions. Palembang, like many large Asian cities, is not easy to navigate. Actually the main roads are well kept and often have three lanes in each direction; however they are filled with cars and motorbikes. Happily there are a lot fewer busses or large trucks as they would add to the traffic woes. The former superior of our International College on his visit to Indonesia remarked that the bikes are like bees! Not a bad description as they dart in and out of traffic. Actually it is probably easiest to travel around the city by motorbike. I still think Vietnam takes the cake for the number of bikes per square meter, or foot in our American way of thinking. In addition to the four churches, I had the chance to visit the tomb of Fr. Tom Fix, an SCJ from Milwaukee who came to Indonesia when I was a novice. Actually he was the first SCJ I ever met as when I was accepted to attend our seminary at Great Barrington, Massachusetts in 1960, he came to visit my family, along with the superior of the Great Barrington seminary. Fr. Fix was the last American SCJ missionary in Indonesia. In his last few years he was spending a great deal of time in India where the SCJs established their presence in October 1994. Fr. Fix died in April 2012. He is buried in an impressive mausoleum built by the Caritas Sisters who have a long-standing relationship with our SCJ community. Our last stop before returning home was to enjoy lunch with the Caritas Sisters who once a month have a special meal for the sisters celebrating their birthdays. I believe we were celebrating four birthdays today. The Caritas Sisters were originally a Dutch Foundation but for all practical purposes it is now an Indonesian community with only a few elderly sisters still in Holland.